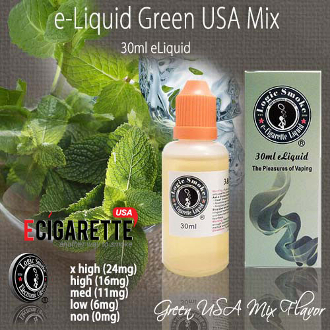 Our Green USA Mix E-liquid from Logic Smoke is the go-to e-liquid for multitudes of vapers all over the world. It’s great combination of tobacco flavor and frosty menthol will satisfy you in a way no other menthol flavored e-liquid will. Pick up a bottle of our Logic Smoke Green USA Mix today and be satisfied. With the perfect blend of an 80/20 PG/VG mix (propylene glycol and vegetable glycerine: organic, food grade preservative compounds), you'll get the best flavor concentration along with the perfect amount of vapor to satisfy your vaping needs.